The Extech AN100 thermo-anemometer offers simultaneous display of ambient temperature and air flow or air velocity. Up to 8 easy-to-set area dimensions can be stored in the internal memory of the Extech AN100 thermo-anemometer. 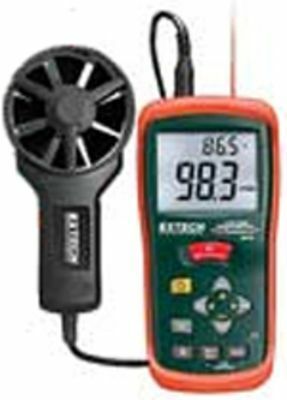 The Extech AN100 thermo-anemometer has a air velocity range from 0.9 to 67.2 mph (or equivalent) and features a 20-point average function for air flow and a super large LCD backlit display. The low friction 2.83" D ball bearing vane wheel on 3.9 ft cable produces a 3% velocity accuracy. Other features of the Extech AN100 thermo-anemometer includes data hold, min/max readings, and an auto power off. The internal temperature sensor measures ambient temperature from 14 to 140 F.
The Extech AN100 thermo-anemometer ships complete with vane sensor with 3.9ft cable, 9V battery, protective rubber holster, and carrying case.